On January 26th, the US Navy held a ribbon-cutting ceremony to celebrate completion of the Beaver Creek Restoration project at the Manchester Fuel Depot near Port Orchard, Washington. The event was covered by the Kitsap Sun in their story, “Navy, partners celebrate Beaver Creek Restoration,” which featured remarks by GeoEngineers project principal and environmental scientist Wayne Wright, PWS. The project was also the subject of a news broadcast on Seattle’s King 5 News. The project was a collaborative effort with biologists and engineers from NAVSUP Fleet Logistics Center Puget Sound, Navy Region Northwest, US Army Corps of Engineers and the Suquamish Tribe. When the project began, Beaver Creek and environs bore no resemblance to their natural condition. The streambed had been straightened by the Navy to support the war effort during World War II. As a consequence, much of the surrounding habitat had been filled in or damaged. After reviewing historical documentation of pre-World War II and pre-development conditions, GeoEngineers created several conceptual design options for a naturally functioning stream system. The design phase included detailed watershed review and geomorphic analysis, as well as geotechnical services for the culvert and bridge structures included in the design. 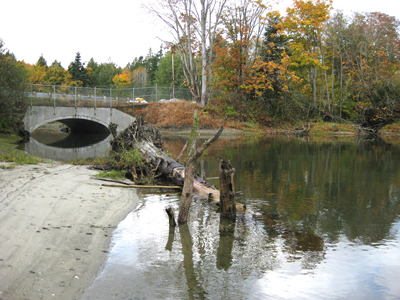 Through its four phases, the project encompassed restoring the stream channel and floodplain from the Manchester Fuel Depot property line down to the estuary where Beaver Creek enters Clam Bay in Puget Sound. To fully restore fish passage, GeoEngineers planned and designed for the removal of two fish ladders near the mouth of the stream and the installation of a 32-foot, pre-cast concrete bridge. Upstream, the team planned and designed for the removal of an existing culvert and installation of a 22-foot bottomless arch culvert. The team also removed several existing instream fish weirs, re-graded the stream bed and constructed a side-channel flood-pond as over-winter fish habitat. Overall, the project recovered approximately three acres of downstream floodplain and estuary as active habitat, and the Beaver Creek sub-estuary is reconnected with the stream channel and Puget Sound. In combination, all of the treatments that GeoEngineers planned and designed resulted in a naturally functioning stream ecosystem that is rapidly recovering from past disturbances. Now water, sediment, fish and the associated forest riparian zones of the lower Beaver Creek watershed function in synergy and balance.